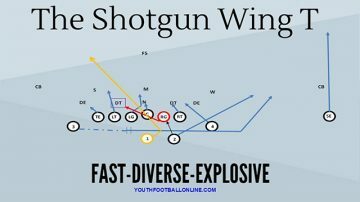 There is no more dominating of a run scheme than Power. Power uses angles and leverage to give the offense a numbers advantage to run the ball in the box. Once they have gained this advantage the defense has no option but to start adding defenders into the box. When this happens they open themselves up to the Power Pass. The Power concept is the most basic Gap blocking concept in offensive football. Gap blocking relies on the offensive linemen on the play-side blocking down on their inside gap. Once these players have blocked down there will be a blocker who will block out on any remaining players and another player who will lead up through the hole. In our version of the Power Play the play-side Tackle Guard and Center will all block down on their backside gap. This will leave the C-gap defender unblocked. The H Back will be responsible for blocking out the C-gap Defender. Meanwhile the Backside Guard will pull around and block the play-side linebacker. When done effectively this will create a clean wall to keep defenders to the inside and a lead blocker for the Running Back. There are two main ways defenses attempt to stop the Power Play. The first, and most simple, way is to add an extra defender to stop the run. This normally means they will take a Safety who used to be defending the deep ½ of the field and give him some responsibility in the run game. The second main way defenses will combat the Power Play is by having their C-gap Player crash hard on the Kick-out block which will force the Running Back to bounce the ball outside and give the rest of the defense a chance to catch up and make the tackle. Luckily there is one play that combats both of these solutions. The Power Pass is designed to take advantage of both of these adjustments. On the Power Pass the playside receiver will run a Go Route. If the Safety has added into the run game this will leave him wide open for an easy completion. If the defense has gone to a Cover 3 look where the Cornerback is the Deep Defender than the H Back will be open on his Flat Route. On this route the H Back will square up the C Gap Defender like he is going to block him and then release outside past him. The result, when combined with the receiver running a Go, is an open receiver in the Flat.